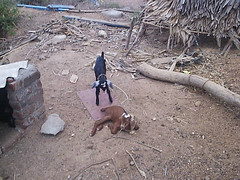 Goat fights; both jump and batter their heads… they said some time it even broke their horns. 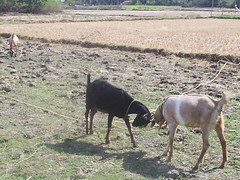 It’s a childhood entertain in village. Palmyra vehicle that made in empty palm shell. 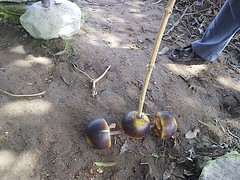 Those days we make this when we go to fields and roll the way returning to the house (cousin uncle’s house). 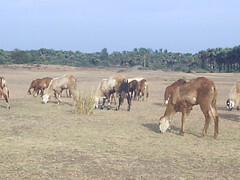 They rushed to the lake to eat the dry grass. Get to near the sheep’s, stopped to watch, but haven’t drive away. 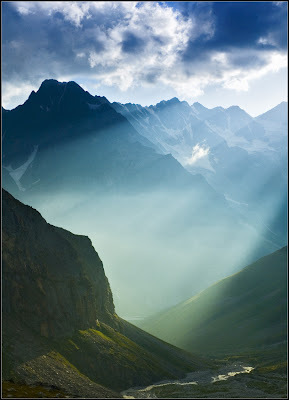 Sun is near to hide. After a long time being with sun! 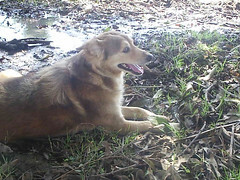 This dog named Jony, was very intelligent and practice lovingly. They talk with it and it also understands and obeys their words. 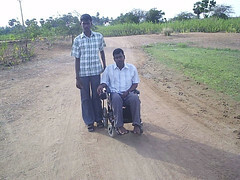 Every time we go to village he join with us and comes everywhere we go. 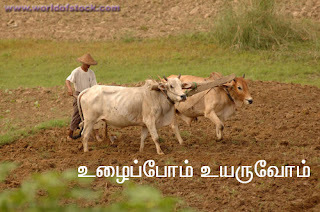 This old man is plough setting the land with his bulls, for cultivate. 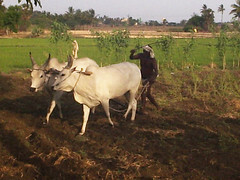 After tractors were introduced this type of plough setting has decreased. 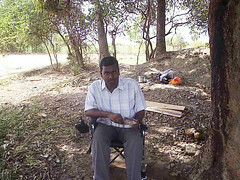 When we were taking him a photo he shouts “yaarupa athu photo edukurathy” (who is that taking photo). These little goats (totally 3) have a consensus, that they have white shades in ears. I kept them in my hands; the hairs are very smooth and soft. Adorable! There was a line in Tamil “Thalaiku vanthathu Thalaipagaiyoda pogatum” (what comes to head let go by turban). If anyone from the six corporation cities in Tamil Nadu, then this line is for you (for other areas its from July 1). There are just two days left to the final install of the law to wear helmet compulsory while driving two-wheelers was coming into force. 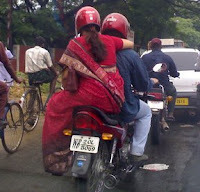 Per 1988 motor act 129 those whoever driving and sitting behind the two-wheelers has been compel to wear helmet, but in 1989 it have be withdraw by government. Now this law have brought again, as the heavy flow of vehicle, rash driving to accidents have increased and most of the time injuries are in head that lose the life. Even there was no act, very little much of people were wearing helmets and many were careless of their protection. As per survey static’s, for every 4 minutes one person were injured in head and in the six reasons to death, this is considering as sixth one to die. In many countries even a 3 year child were advised to wear helmet when riding cycle, here some above the teen aged people are unaware of their safe, but could notice the increase of wearing helmet’s in last two years. When the helmet businesses were in high, an organization belonging to two-wheeler association was announced to fight against, if the helmet were made compulsory. This law needs some concentration when moving into force. The govt. must clear properly in taking children in two-wheelers and a strict ban in how many should be taken in a two-wheeler. Even the govt. 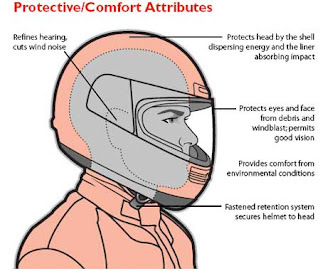 compel on helmets, there are something important to change like good roads, clean arrangement on directions, restriction on using cell phones while driving and takeoff unnecessary obstruction on roads that disturbs (esp. in ECR the obstructions are in highly dangerous to cut turn). Till these and more or not made, we can’t get a safe ride is sure. 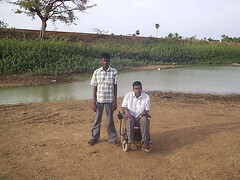 Today my cousin brother Aravind’s birthday, seems little distress for me now. Every year we celebrate his birthday by cutting cake in my house, at the time he used to be in holidaying with me. With presence of grandpa grandma and others singing happy birthday to you… last year it was to celebrate in kodaikanal in our vacation and it was an unforgettable movement. 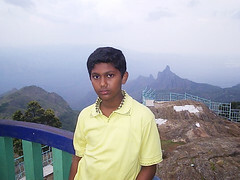 But this year staying away from me; he may be spending his B’day in a new place with schoolmates (for the first time) in Kotagiri boarding hostal. Except one or two years, I was with him on his birthdays. His first birthday memories would come rarely sometime to me, like now. As I like kids, from the day he born I love to be with him. It was first delivery for my aunty, so she stays for months in my grandma’s house. Weekends must be with him, keeping him on my lap and touching his hands, just adoring his little movement while sitting beside him are making me smile here. 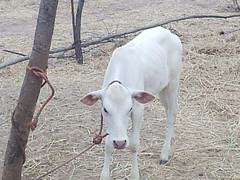 :) From before few days to his B’day I started to collect money to buy a gift for my cute brother. On his B’day I brought a teddy bear and I was carry it with me till handing to him. He in a white t-shirt and blue trouser with his rolled cotton candy hair, I present him the teddy bear before he cut the big He-man cake and got a kiss from him and took photo’s. 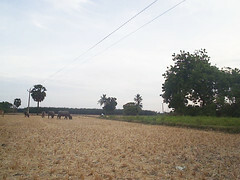 The day starts with not that hot to travel out of city to the village of my mom’s aunty. 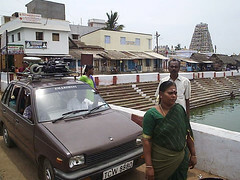 After half the way with heavy traffic of heavy vehicle (this is commonly notable in IT corridor, ones Old Mahabalipuram road), first we visit the Murugar temple in Thiruporur the one I visited in last December. This time also seated near a good view at tank that has shortage in water compare to last time. It was not at all surprise that filled lake was totally dry in the 42 degree Celsius temperature this summer. Spending few minutes and tasting the pure buffalo milk… what a great drink it was after long times of drinking packed milk from shop, in mom’s aunty house we headed to joyful place, the fields. 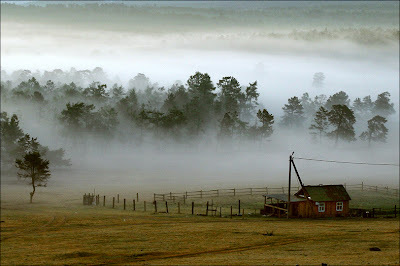 That’s one of a pleasant place it was in our world. 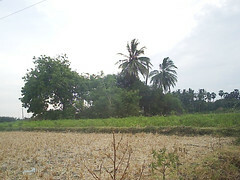 From the polluted and always noisy days in city, just relaxing under the clam and cool wind giving large mango tree, surrounded by green field and breeze of village is welfare. Eating Palmyra fruit, tender water by passing time with cousins, finishes the lunch under the tree with cousins, mom, and dad. But the only missing joy was, wetting the foot in the canal of the pump set water (like last summer), due to electric cut. 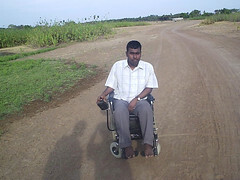 Thanks to my power chair that makes me to move around the village, which was a small expectation for long… today it gives a big excitement that would be unforgettable. 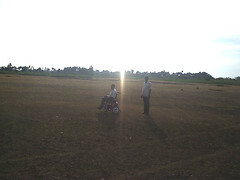 Had a free ride in the evening on the dry lake with cousin. The sun was to set behind us the place gives me a enjoy mood as the group of sheep’s arrive and buffalos bathing in small stayed waters. Breaking the empty small shells on the lake was fun u see. The sounds from it was very different, we went near the lake water, which has big fishes. 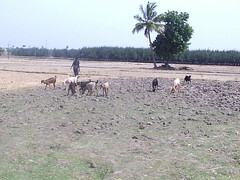 While seeing the sun, the dry lake and groups of sheep’s it took to me the Veyyilodu Vilaiyadi song from film Veyyil. Its disappoint that the electric came just before we leaving, so coulden’t enjoy in water. 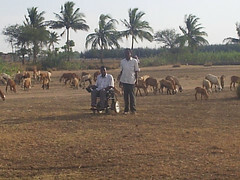 Village people were seeing my chair with differ, but there was a feel that day-by-day the village is losing its nature. Concrete houses, high compounds and fencing lands, which could see as concrete floors soon, gives me a thought how much days are this place looks like as it be now and when the agriculture lands loses to the industries there is nothing like development kills the nature. Mind craves to spent some more times there, but can’t as it was 6 at evening, driving on the traffic road, that too in dark is hard to dad. The Healthy party in state always trying to object evil thing to people. First it was smoking habit increase in people because of films using smoking scenes. (Don’t know were the law to bring ban for smoking scenes is sleeping). They give crisis for old man’s government from beginning to close liquor shops in state as its evil for people. While going through his statement recently asking government to close the liquor shops and last weeks fury speech to smash all liquor shops in state. I think they are in urgency. Closing the liquor shops is not that easy, as they close the shop all drunkards will stop drinking? or can they leave the habit of drinking suddenly? They automatically look for the illicit liquor or deceit drink that brought from other state. In our state there are many helping mind people who are to understand the expectations of drinkers, and take it as there practice. I could go with healthy party that many families are suffering by drunkards who fail to take care of their family and children. Could see many women who are working as house worker in residents are facing the drunkard husband. Till drinking was not be controlled by Indian law, we can’t make a end point. What I tell was we need more rehabilitation centers, before that the government should take a survey about drinkers and make an organization to find the drunkard’s family and make a chat with the family members to create an aware against liquor. I feel without the family’s support we can’t change the drunkards. None of them would like the one in his family destroying himself by drinking. The mind changes are the only change that could turn the drunkards as normal people. If it happens the liquor shops would be empty with no one to buy the bottles. Not only this, the shops must be reducing as people get out from the drinking habit. Will government do this? Information from govt. 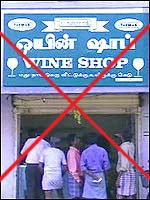 side said that they are not ready to close the liquor shops, because it was the high income-giving department to govt. Whoever there fear like me to cockroach here is to tell that roach is not that scary or dirty as we think according to a Taiwanese study. Before knowing that I want to tell that not only cockroach I am an insect scary. I fear for even small insects, today morning this small spider disturbed by sleep as it was climbing the wall and fall beside me and it was doing the same till I getups from the bed. After reading this news little pause seeing spider’s. To start with the study, cockroach eye is an arrangement of around 3,000 lenses and it can smell food over 20 meters away. It breathes through body holes called spiracles that can be closed with a kind of hairy lid. So, if you flush a roach down the bathroom it doesn’t drown; it just shuts off the holes and swims to safety! The best thing it does is eat up our garbage. Could we scream when seeing the garbage man just because he works amongst rubbish, right? But…. Pushing Bus to get start becomes old fashion; latest one is push the train. Guess what passengers were asked to do when the train came to a standstill in Bihar(India)? The driver asked them to get down and push! The electric train was cruising along a zone that did not have overhead wires when someone pulled the emergency chain bringing the train to halt. The way out was to nudge the train till it connected with the overhead wires a little ahead. After half an hour of pushing the train found the overhead wires, and soon on its way. Where do we all keep the fishes (I mean the fish to cook)? All keep them in freezer or refrigerator right. Here is also a person kept the fishes in freezer, but in which freezer is matter. The nursing staff at the Institute of Child Health at the Kottayam Medical Collage was stunned to find 5kg of pearl spot fish in the freezer meant to stock preventive medicines. A paediatric surgeon is said to be responsible for the smell act. According to the superintendent of the institute, he had the habit of storing fish in the freezer. He has been suspended from serving and an inquiry is on to find out whether he had accepted the fish as a bribe or whether it was a deliberate attempt to trap him. 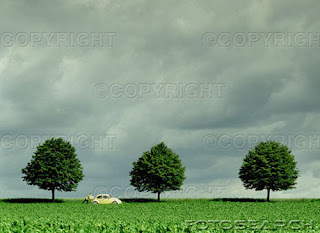 Thinking about the picture? It’s a wonder bus called Topsy-Turvy Bus. 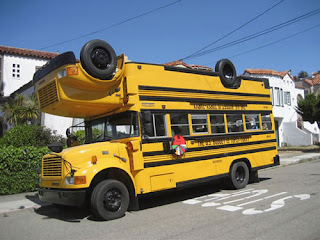 It is two school buses welded together, one upside down on top of the other, that is currently touring the country to “dramatically depict America’s upside down budget priorities”. The bus was created by mega art car artist Tom Kennedy in Oakland with a team of 10 artists, who have a background working on art car and Burning Man projects. This bus has a blog on its update touring. I am not he, trust me I am not he. I mean I am not that lucky boy Jeevan who romanced and cheated the five beautiful girls in different getups through this film Naan Avan Illai! Getting the first place in Top Ten, and one of my congenial actors he was, just thought to give sometime to this film. This is another step of Jeevan’s successful Thiruttu Payalae, but the scenes moves like small child’s stand (Chinna pillaithanama’la irukku). This film is a beginning of the re-making the old hits trend in Tamil Cinema… hope to get more film on this way. Nothing to tell as much about this film. First as an England citizen; as a niece of Chief Minister in Malayalai getup; as incarnation of Lord Krishna; an employee and finally as famous painter, he stoles the big screen as a playful boy. In all this, his Lord Krishna incarnation was funny but ok. The point he gives for the foolishness of some women’s was acceptable; if they reduced the heroines, and give strength to the character would be fine as message to today’s young people. About songs, every heroine has one, at different location in glam costumes. Pleased to picturesque of the songs with colorfully. Nee Kavidhai song… in the waterfalls and in houseboats at backwaters of Kerala and Ean Enakkumayakam… was beautiful. Ratha kadal varatha... my favorite song was wonderful, even it was captured in the sunshine. Can watch the film for Jeevan! On Sunday I was been to my routine beach with family. The crowd less beach was crowded that day many was roaming with bats for correct place to start their match and already some involved in cricket. As usual our family business starts, to chat their interesting and worst movements, that was to be irritating actually when talking the same, but one-thing marketed well between us is snacks. I enjoy being with family esp. if it was to spend with my sweet aunty. It’s like an annual meet by all, but except my sister and cousin bro who was in hostel, it looks dull. 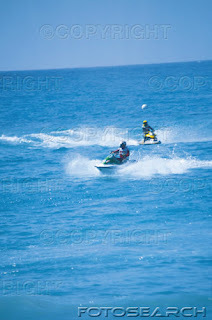 Sometimes I could watch the water bikes in the beach, jumping on the waves and speeding on the sea. They have a vehicle to take the bikes behind their car. This time too there was a fat guy was riding on the bike in the heavy waves that day. An exciting movement when he jumps against the waver in height. He has been couple of rounds carrying someone in his back, people were seeing in wonder. While playing in the waver on bike suddenly he left control and over turn to dash on the sand when waves hit the bank. Good time both were safe, but bike damaged. It was just funny to see people started to crowd to see the water bike that was put on repaired after it over turns. Actually there was not more to help when he fall, after taking to shore all were coming from there seated place to see it. Even those on their way in road stopped their vehicle and rush to see what is happening there. Curious grannies go to see the bike, aunty and me were laughing to see people crowding more that something is seriously happening. At 7.45 in evening the vehicles were slowly moving in the long line of traffic in ECR, because of a meeting in center of the road. Sure it was to close our ears to avoid hearing the mess speech of a former state minister scolding the ruling old man and his son’s. It was 9 at night after dropping aunty and grandma at their place. The real attention to mind. Dayananidhi proves he is true gentleman!! In his much good plans the Re.1.00 per minute to talk throughout Nation is the best one I admire. He is a neat and well-mannered Parliamentarian. I felt his resignation it’s a lose of good projects to people. Two kids in this talk show bring laugh and wonder by their speech some weeks back. In this one was rivaling with other one that was interesting. As I was thinking they have come to talk some kids problem they are facing in their school and studies, but late day one of the kid was stopped me to raise my eyes to amaze that being in age of 7-8 she works in some Ad company by earning 1500Rs. a month and make her elder sister to continue here studies. Losing her mother and father being a sick person this small has realized their situation and lives by loosing her normal life. I couldn’t find what other kid suppose to tell or told (in the shows that I missed). Away from our views there are many wonder things like this happening everywhere. This is an ex-example for us, when this small kid can understand everything well and hardworking in this stage, why can’t some educated and healthier people esp. youth are not making use of them. I could see this in my relative circle and heard from others, some are only complaining and trying to avoid from working. When the government was banned for child labors that parents force kids to work, here this kid carries her family by working, hope the government come forward to help her. They are very good in studies and worst in they’re character; sweet sometimes, but mess sometimes; acts like an innocent, distress by the words. This is what a child I could watch recently by shocking in his talks. If a child was disobedient and indecent the parents should sternness, not to laugh as it encourages them. 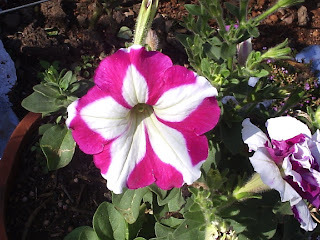 People thing punish changes them, but in many cases punishment makes them anger and that blinds their mind, what I think is the parents must learn how to sternness the kids by their affection, not by the useless tool anger. The children needs love, affection not the over indulgence; love must help to grow positive ness inside them; in the child I watched has taking the love to hide his negative side. I am not against children, but cared on them. Couldn’t be quite from stopping to express my thoughts that it still sliding in mind. 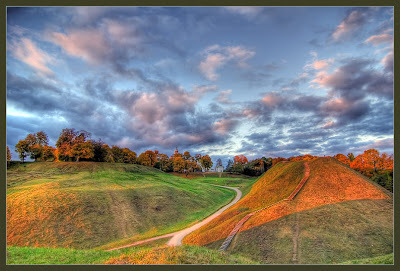 Thanks Karthik for intro to post song in my blog. Can u buy a mother? Can it bear like a mother? Who created you and me here? will make to catch the moon. welfare is in mother’s lap. Evening in my way on the wheels was very bright with the whole view of reddish sun and the crimson sky. Stray dogs sleeping on the roadsides and sudden attack on speeding two wheelers, but being quite and get away from my way whenever I passing them. There was this girl triple in age think being with poverty, by holding her mother’s fingers and walking with barefoot. Its distress to see it that the soft foot were scrubbing on the tar road and stamping on unknown things and worms. When many kids were roaming in the life styles (big shopping mall) to select their favorite footwear’s, here this kid without any protection to her foot. When I was thinking about her pity stage. After leaving little feet away she turns towards me with her face full of face powder with fast move in her legs with mother. In her move, I could notice she calls her mother and tell that brother is sin. Her mom in some hurry I think, by carrying another kid in her hip, she didn’t listen to her and walked fast. I feel it what a consensus that we both thinking about each of our stage. 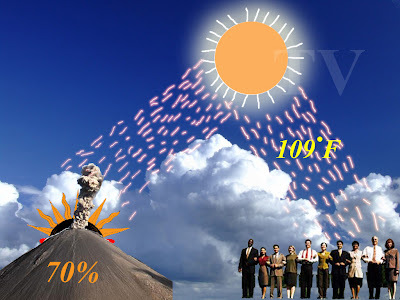 Last day city faces very hot waves from the sun the most high of 109 degree Fahrenheit. Unexpected incidents created by 70 percent. Will nature listen to this soul? There was this show with 4 little ones to send me trance with their sweetest nature; but it just extend for half-hour. If you were watching Suntv’s Pudhiya Raagangal on Sunday, u must be feeling the same. (This is a musical talent search show in the form of a competition, introducing new voices every week.) 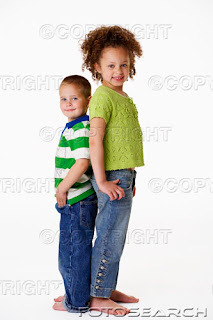 First time very small children where participated and they also proved they were similar to adults. Singing in their invariable children’s prattle and giving movement for the cymbal have been adorable. In their cute skirts and exciting smile on their face was loveable. Little one in her red skirt and beautiful cap was attractive that too expressing herself with the song’s music and lyrics was wonder!! The mix of confident in their sweet talk and the talent that comes out form them are example for others. Still the show comes before my eyes. Nowadays this show gives me joy mood and waiting for the Sundays to arrive. In these two years of blogging an experience that could never compare to any other times in my life so far. Blogging starts as a hobby and it grows as an informative valley, turn as a place to expression the thoughts, and it reveals the feelings through words. 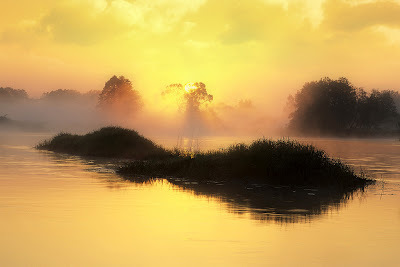 The happiness given by you all creates a sense of a new dawn in my life. Positive thoughts grow every time while going through your thoughts and experience. You are the only buddies always here to encourage me more and listen to me. If I was away from here for some days, you have been thinking about the reason for it and wised for what ever I am doing. I must tell the support and the confidence that I earned from you is my only strength now. Above all I got the courage from you to face my life. This is time to thank my friend Ghost Particle and his project team for selecting my short story Limestone Forest as one of the winning story months back. 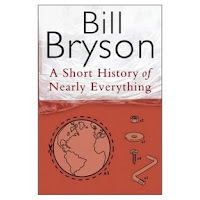 This week I received a wonderful book "A Short History of Nearly Everything" from him for winning. This book amazes me going through every page and it also recalls some of my school science. Totally I was not confident and felt bad to send him a useless story that comes to my thought. He only said that it comes from my heart and I hold a hope in his words. I think the real winner is the ‘hope’ he gives. Hi my sweet friends, I had been away for just few days, but thinking always about this place and you all. This gap was with a reason of expectations, though here nothing happens as I expect. The cousin whom I like more and me asking my uncle every day when his exams finishes? has spent couple of hours and left me alone and went on his way, now he was holidaying in his grannies village. That makes me repent, the time I worked have been speeded mostly for the times to share with him. My another cousin who have to be away from me in this summer days, with no way to avoid it; even it makes me feel, I am glad he was to be away to progress his life. I am happy for my cousin bro Aravind, who has left to experience great movements in his life in Western Ghats, the queen of hills Nilgiris, to continue his studies from boarding school in Kotagiri. 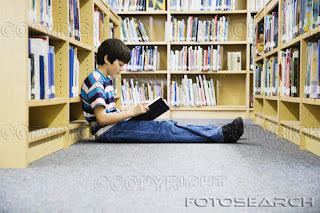 Its dream place for many to study form a lovely environment, cool weather and standard education. In this my bro is lucky. All were not willing to this idea, even me, but I solace this step is must for his life; I hope this place will realize him who he was and it create him as a responsible person. My dad used to worries sometimes telling his wish to join me in the Mont fort School in Yercaud (a hill station) when I was in my childhood, but that times his wealth was lack, when we were wealthy, my health was obstruct to his wish. Even In my busy works I was enjoying with a special person who is non-than my small cousin brother Ashvin. He won’t stay anywhere without his mom, this time he was with me over four days. Sitting beside me and frequently asking some doubts, I join with him as a kid to play with small cars that I do always before. We went to nearest beach in evening stay till night, chatting with bro and going along the street in the beach side with power chair is pleasure in this summer weather.